We’d love your help. Let us know what’s wrong with this preview of Serpent's Kiss by Deborah Cooke. The dragon shape shifter Thorolf is known for an impressive lineage, raw power in battle, and an impulsive indulgence of his appetites. The last has made him an outcast from his fellow Pyr, and even his hunt for their dangerous opponent, the Slayer Chen, hasn’t helped. Beguiled and weakened by Chen’s ally Viv Jason, Thorolf fi One spark can banish every shadow in his heart. The dragon shape shifter Thorolf is known for an impressive lineage, raw power in battle, and an impulsive indulgence of his appetites. The last has made him an outcast from his fellow Pyr, and even his hunt for their dangerous opponent, the Slayer Chen, hasn’t helped. Beguiled and weakened by Chen’s ally Viv Jason, Thorolf finds himself drawn into a trap, as bait to lure his fellow Pyr to extinction. The only one to come to his aid is a woman he already knows to be a thief—does he dare to trust her with not just his own life but the survival of his kind? To ask other readers questions about Serpent's Kiss, please sign up. Thorolf is the lone-wolf, loose cannon of the dragon shifters known as the Pyr, but he has his reasons. Now after having disappeared for two years he suddenly materializes when his mate-seeking firestorm begins, but his destined partner is not human either and is harboring many dark secrets of her own. The Goddess Chandra is known by many faces and has spent centuries preparing for this very battle to help the Pyr survive extinction from their diabolical dark brothers the Slayers. Unfortunately Thorolf is the lone-wolf, loose cannon of the dragon shifters known as the Pyr, but he has his reasons. Now after having disappeared for two years he suddenly materializes when his mate-seeking firestorm begins, but his destined partner is not human either and is harboring many dark secrets of her own. The Goddess Chandra is known by many faces and has spent centuries preparing for this very battle to help the Pyr survive extinction from their diabolical dark brothers the Slayers. Unfortunately her being immortal never alerted her to the fact that she’d also play a vital role by being the mate of one of them. Maybe now is time to remember her eternal vow of chastity, or maybe not. Wow! Deborah Cooke’s reign as dragon mistress continues as she brilliantly presents Thorolf’s firestorm. Pairing him with a Goddess and making their story so imperative to the survival of the species was pure genius and just what this enigmatic, reluctant hero needs. Her dragon and mate character catch up informs and entertains, her expert mixing in pertinent newsworthy information rocks and her backdrops both real and Myth are impressive. But it’s the pure magic of her storytelling that as always sets this novel and this series apart. Bravo Deb, we’ve only got one more in the Dragonfire series to go but I know you have more dragon tales in store for us and I can’t wait. okay so the ending felt a little rushed and i would have loved more focus on the relationship, but it was overall a pretty good story but the next which is the last had better hit it out of the damn park. He’s known for an impressive lineage, raw power in battle and an impulsive indulgence of his appetites, but Thorolf is now an outcast from his fellow Pyr and Chen has drawn him into a trap. She’s a sorceress who’s trained all her life for a battle against evil that will shape the future and Chandra has never experienced passion. Readers are held spellbound throughout this thrillsational Dragonfire novel. Chandra and Thorolf have quite a few obstacles to overcome as the firestorm demands more tha He’s known for an impressive lineage, raw power in battle and an impulsive indulgence of his appetites, but Thorolf is now an outcast from his fellow Pyr and Chen has drawn him into a trap. She’s a sorceress who’s trained all her life for a battle against evil that will shape the future and Chandra has never experienced passion. Readers are held spellbound throughout this thrillsational Dragonfire novel. Chandra and Thorolf have quite a few obstacles to overcome as the firestorm demands more than Chandra ever expected to give since she has a mission to save the Pyr. Thorolf will have to decide if he can trust Chandra with his life while struggling to overcome the after effects of what Chen has done to him. This keeps emotions running high and keeps the romance is suspense throughout the story no matter how hot firestorm burns. The plot is fast paced and continuously astounds readers with all the thrilling suspense, exciting events and surprising twist that flows from the pages. The fate of the Pyr is hanging in the balance and this story answers a few of the questions that readers have wondered about through the last few books while building up curiosity about the next book and just what will happen next. The strong, bold characters complement each other and really draws readers into their fascinating firestorm even as they wonder if the firestorm will provide with new power or give Chen the chance to triumph forever. Finally we have Thorolf's story!! This review has been hidden because it contains spoilers. To view it, click here. Chandra is after Viv Johnson and believes Thorolf can help her find her. There's just one problem, Thorolf's firestorm keeps distracting them both. Thorolf has lost two years, has a mysterious tatoo and his behavior is completely out of whack unless Chandra is near him. This story has a couple different arcs, the fight with Viv, Chen, Jorge and the epidemic. There was a lot of jumping back and forth not only between the arcs but with Thorolf's health. I loved getting final resolution with Chen, Chandra is after Viv Johnson and believes Thorolf can help her find her. There's just one problem, Thorolf's firestorm keeps distracting them both. Thorolf has lost two years, has a mysterious tatoo and his behavior is completely out of whack unless Chandra is near him. This story has a couple different arcs, the fight with Viv, Chen, Jorge and the epidemic. There was a lot of jumping back and forth not only between the arcs but with Thorolf's health. I loved getting final resolution with Chen, Viv and Jorge but the one step forward two steps back as well as Thorolf behaving like a teenager at times detracted from the overall book for me. Once again Deborah Cooke has given us a breathtaking read. This story of Thorolf & Chandra blends myth & reality into a narrative that completely captivates. The rebel Pyr redeems himself & uniites the brotherhood & their mates. Raching the end of bittersweet because only one more remains in this superb series. Gotta tell you, I just love dragons and dragon shapeshifter stories. I see that this is number ten in a series and while it is clear there is backstory, it stands on its own. Some woman done the hero wrong back in the day, so of course, he has trust issues. The heroine is pledged to celibacy and is an intriguing mix of every virgin huntress goddess in all the myths of all the world. There is great evil loose in the world and this bunch of dragons is pledged to fight it. Chandra is also pledged to Gotta tell you, I just love dragons and dragon shapeshifter stories. I see that this is number ten in a series and while it is clear there is backstory, it stands on its own. Chandra is a sorceress who has trained all her life for a battle against evil that she knows will shape the future. She has never wasted time on the pleasures of the physical realm, much less experienced passion—until the firestorm sparks between herself and Thorolf, demanding more from her than she ever expected to give. Will the firestorm provide new power, or be a dangerous distraction that gives Chen the chance to triumph forever? 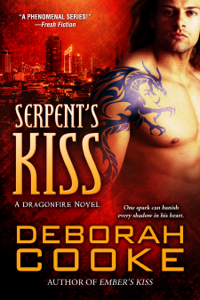 REVIEW: SERPENT’S KISS is the tenth instalment in Deborah Cooke’s contemporary, romance Dragonfire paranormal series. The Pyr are shape shifting dragon warriors whose duty it is to protect humankind. The continuing series focuses on a dangerous threat against the Pyr who is determined to destroy the last of the dragons and their mates. This is Thorolf and Chandra’s storyline. Thorolf has been missing for twenty two months and in all the time no one had considered that perhaps he was in trouble. When Erik, the leader of the Pyr, sent Thorolf away for revealing their existence to humans, no one suspected that Thorolf would walk into a trap that could very well bring about the demise of the dragons on earth. An ancient dragon whose need for power and Dragon’s Blood elixir will target the easy going Thorolf using a seductive female as the bait-one that is not Thorolf’s intended mate. Deborah Cooke pulls the reader into a storyline that is the beginning of the end. SERPENT’S KISS is the second to last instalment in the Dragonfire series and with it comes the conclusion to a battle that has raged between the Slayers and the Dragons for most of the series and throughout each consecutive instalment. SERPENT’S KISS focuses on the possible demise of the race of dragons; the battle between good and evil; and a mythological storyline about a warrior huntress whose destined mate has been drawn to the dark side without his consent. There are many references to Norse mythology and the interference of the gods in human evolution. The storyline is slow to build and the relationship between our leading couple takes a back seat to the overall premise. There is very little romance and the attraction between Thorolf and Chandra felt forced-there was the instant attraction of the firestorm but the reality of the situation was more chemical than physical. I did not get the impression that love was in our couple’s future. Chandra continued to push Thorolf away and in the end, Thorolf discovered that Chandra had been lying to him about her true intent. SERPENT’S KISS is a story about betrayal and family; power and greed. Most of the previous storyline characters play a secondary role throughout the novel. Erik will once again question his ability as the leader of the Pyr but it will take the collective of dragons to save one of their own from himself and Slayer Chen. I did have one concern and it involves the title and the cover image. Serpent's Kiss by Thea Harrison/Serpent's Kiss by Deborah Cooke both involve dragon shifters and both covers use Sam Bond as the cover model. Initially I thought this was a re-release thinking I had previously read the story then realized it was a new release from Deborah Cooke. I am wondering how many other readers had a moment of confusion with the duplicity of the title and image? "Serpent's Kiss" by Deborah Cooke. Book 10 in the Dragonfire series. I liked this book. I've always wanted to know Thorolf's story since he was introduced a few books back. I really liked the character of Chandra, who ends up being Thorolf's true mate. There are basically two storylines to follow in this book. One is Thorolf's background where he has been destined to save the Pyr (good dragon shifters) and the second is Thorolf possibly turning into a Slayer (bad dragon shifters). I was really intr "Serpent's Kiss" by Deborah Cooke. Book 10 in the Dragonfire series. I was really intrigued with the second storyline more than the first even though both storylines are intertwined very well. At times the phrasing of some of the paragraphs seemed "jumpy" (switching topic out of the blue) and I found myself re-reading some of those parts because I felt like I missed something. But I will say that part of the story is that Thorolf changes personality because of what's been done to him (I won't say what because I don't want to spoil it for you) so the "jumpy" parts do make sense. As for Thorolf saving the Pyr storyline, that part I didn't really understand. I don't want to ruin anything for you but the destiny Thorolf is meant for, ends up being more about saving the world and humans more than the Pyr (as least, that's what I got from the story anyway). It was also thrown at you really quickly, like "oh this is what Thorolf has to do?" and then at the end of the book he goes and does it. The firestorm's sexual tension between Thorolf and Chandra was really good but I found the culmination of the firestorm was just OK. I was expecting a little more from the "satisfying the firestorm" scene because, through the whole book, Thorolf keeps saying how he wants make it right/good for Chandra, and then BOOM, it's over pretty quickly. I really enjoyed the overall theme of the book which is Thorolf and Chandra wanting to be loved for who they are instead of being loved for what they can do for someone else. I have considered this series & other writings of Claire Cross to be keepers & largely 5*, so I am very disappointed in this book! Since the addition of the Dragon's Teeth warriors, the series moved away from modern issues & solutions - which I highly enjoyed - to Greek mythology (let the gods be responsible for/solve everything). I think that was a cop-out. I accepted it with the previous book, because it did fit somewhat with the Dragon Legion & thought that set of stories was w I have considered this series & other writings of Claire Cross to be keepers & largely 5*, so I am very disappointed in this book! Since the addition of the Dragon's Teeth warriors, the series moved away from modern issues & solutions - which I highly enjoyed - to Greek mythology (let the gods be responsible for/solve everything). I think that was a cop-out. I accepted it with the previous book, because it did fit somewhat with the Dragon Legion & thought that set of stories was well-done. I absolutely do not accept it for this book! This book was cliched, awkward & annoying from the very beginning. I could find nothing to connect me to Thorolf or Chandra...what a whimpy "hero" and goddess! The book simply plods. Betrayal, despair, betrayal rage, betrayal...let's f*ck & forget it. So much promise, so much that could have been done with it, but no, now it's all the fault/product of mythology...instead of humans needing to learn to become harmonious with Gaia. Yeah, I'm pretty sure that Bangkok doesn't have dudes running around calling for "police officers"; there were so many mistakes that nothing seemed to fit. Jumping around in mythology, again so many mistakes & gaps. And wth happened with Tisiphone?! There was a perfect opportunity for some character development on everyone's part...it was RIGHT THERE and happening, but no, it was just easier to chop her head off & move on to some other completely wtf piece of mythology! How did this move the story along? I received this book free through the First Reads program. This is the 10th book in the series, and while I had not read any of the previous books I was not lost in the story. It was clear who was good and who was bad, what the bad guys were doing, and if there was any uncertainty about what happened, that was because the characters in the book didn't know either. There are a lot of characters who clearly were part of adventures referenced (lightly) from previous books. However, the short referen I received this book free through the First Reads program. This is the 10th book in the series, and while I had not read any of the previous books I was not lost in the story. It was clear who was good and who was bad, what the bad guys were doing, and if there was any uncertainty about what happened, that was because the characters in the book didn't know either. There are a lot of characters who clearly were part of adventures referenced (lightly) from previous books. However, the short references also gave me enough to go on so I didn't feel lost. There is a scene at the end that is something of a reunion, so those who have read so far would get to visit with all of the characters in the series. And the action required visiting a lot of different people, but that just felt like a natural part of the existing network that was already obvious. The romance was a bit flat for me. The heroine was strong, and I didn't quite get her falling for him. But, at least at first she spent a lot of time being amazed by her own reactions. The fact that they were the focus of a supernatural event that gave them no choice did help with my suspended disbelief. And when events lead to Chandra's powers acting up it made sense, but I didn't really feel the urgency of it. Then there is a climactic scene that seemed to come out of nowhere and didn't make much sense to me. I thought the purpose was to kill someone else, so was confused when they ended up in a fjord somewhere. Has the impulsive and uncontrollable Thorolf been searching for Chen for two years on his own? And are dragons about to be hunted again because of Jorge's actions? Has the pyr seen all the effects of the darkfire? Can and will JP tell them anything about Chen's plans? The pyr don't know the answers to these things, but they do know an oncoming firestorm when they see one and Thorolf is the lucky dragon for this installment! Thorolf's latest distraction, Viv, is pursued not only by him but by the Has the impulsive and uncontrollable Thorolf been searching for Chen for two years on his own? And are dragons about to be hunted again because of Jorge's actions? Has the pyr seen all the effects of the darkfire? Can and will JP tell them anything about Chen's plans? The pyr don't know the answers to these things, but they do know an oncoming firestorm when they see one and Thorolf is the lucky dragon for this installment! Thorolf's latest distraction, Viv, is pursued not only by him but by the sorceress, Chandra, and for an entirely different reason. When Thorolf and Chandra meet, the firestorm begins...and the pair is looking for a safe haven. Leave it to Thorolf to have the most unusual firestorm complete with too many women! With Rafferty at their side the new mates search in earnest for the pyr enemy and to put an end to slayers that threaten their race. New pyr enemies, the effects of Jorge, strong opinions among the pyr and Chen at his most diabolical make this installment an exciting read. I liked the twists that this outing gave, linking the old and the new while telling Thorolf's story and bringing satisfaction toward closing off loose threads. As always this series is awesome Dragon love with twists and turns intrigue romance suspense mystenextry action packed drama kept me eon the edge throughout. I loved that the so called "loser" of the dragons ..... well let's just say I don't want to spoil it for you so I won't say anymore lol. Just trust me a great book to read I couldn't put it down. Literally stayed up all night. I Highly recommend this series and book. This one is the latest so look for the first book and read the series. I am in love with it like every other books in the dragonfire series! I been pushing it back due to school but when i read it today, i finished it in one sitting and i love just how the story between Thorolf and Chandra unravels! Dragons!! Who doesn't love dragons? And no one does it better than Deborah! Love this series and the tie-in YA series also. Just can't get enough of these dragons!! Bestselling and award-winning author Deborah Cooke has published over fifty novels and novellas, including historical romances, fantasy romances, fantasy novels with romantic elements, paranormal romances, contemporary romances, urban fantasy romances, time travel romances and paranormal young adult novels. She writes as h Deborah Cooke also writes under the names Claire Delacroix and Claire Cross.